(Photos to follow.) No, it’s not a World Cup playoff, but there’s still an international flavor to the Sri Chinmoy Self-Transcendence 3100 Mile Race. Known as the longest certified footrace in the world, it pits stellar ultrarunners against daunting distance, as well as brutal heat and drenching downpours. It all takes place around a half-mile loop in Jamaica, Queens, but runners travel from as far away as Russia, Israel, Slovakia, and Scotland to compete. The 2018 winner in the Men’s Division was Vasu Duzhiy of St. Petersburg, Russia, who finished Tuesday night, July 31st. He ran a distance of 3,100 miles in just under 45 days — not the first win for this solid competitor who’s nearly as consistent as Roger Federer. The only American among this year’s starters was Yolanda Holder — a pedestrienne or race walker who was the surprise sensation of 2017’s race. With her unique style, she’s known as the Walking Diva; but this year, Ms. Holder had to retire after 1,200 miles due to foot problems. In a field of many talented athletes, one standout is William Sichel, who hails from Sanday — a tiny island with a population of 550 located in Scotland’s Orkney Islands. The busy streets of Queens are a far cry from the quiet, pastoral setting of his home. With Viking determination, Mr. Sichel is challenging not just heat and thunderstorms, but also the rigors of advancing age. 64 and a cancer survivor, Sichel’s the dark horse hero of 2018, unable to beat the frontrunners, but turning in an inspiring performance, and likely to set numerous records, including one for oldest competitor to run all 52 days. In 2014, Mr. Sichel successfully completed the Sri Chinmoy 3100 in 50 1/2 days at age 60. This year, he’s been averaging 56.5 miles per day — less than the 59.6 needed to finish in the allotted time. He would need to up his average to 70 miles a day for the final 10 days of the race — an almost superhuman task, but not impossible for a competitor who’s shown superhuman toughness and come-from-behind prowess in the past. He ran 70.8 miles on Day 1, so no one counts him out! Sometimes dubbed the “Scottish pocket rocket” and credited with “a mind of iron” (but a kindly disposition), Sichel is competing against 5 remaining runners who are members of the Sri Chinmoy Marathon Team — likened to the running monks of Japan for their combination of spiritual and athletic discipline. The Self-Transcendence 3100 Mile Race was conceived by Sri Chinmoy (1931-2007), a spiritual teacher who was active in many fields, including athletics. Since its inception over two decades ago, the race has attracted mostly students of Sri Chinmoy, but other exceptional athletes are invited annually. In addition to Sichel and Holder, this year’s invitees included Kobi Oren, the noted Israeli ultramarathoner who came to a searing second place finish on Thursday, August 2nd with a time of 46:03:24:48. In multi-day races there are fluctuations in performance, feelings of highs and low, abject despair, and undiscovered elation. These races reflect the struggle to survive another day, to assess effort but not to associate with the pain and sweat, but rather, conserve the energy for the next group of laps, or hours, or even stretches of days. Take a power nap, or stretch the stiff legs, and try again. My body adapted very well and I started running further and further each day as the race progressed. But mentally I found it to be the most enormous struggle especially when things were going against me and it looked like I wouldn’t finish in time. To regain mental control I had to narrow my focus right down to just being aware of my breathing, only thinking of the next lap and never, ever thinking past the current day! Simple as that. Perhaps this explains why ultramarathoners are more likely to be in their forties or fifties than their twenties. Physical strength is important, but is not the only factor. To run 3,100 miles requires special qualities of mind and heart which must be cultivated over decades. One-pointed concentration on a goal is also the point of intersection between the athlete’s world and the spiritual world. The total commitment needed to run the equivalent of two marathons a day for 52 days seems to demand coping skills not acquired until middle age. William Sichel has above average coping skills. In 1997, he was diagnosed with testicular cancer. Two months after surgery he was back in training, soon setting distance records for Great Britain and Scotland. His second bid for the Sri Chinmoy 3100 was scheduled for 2017. But on June 12th, the day before he was due to leave for New York, his wife Elizabeth received news that she had been diagnosed with lung cancer. He withdrew from the race and cared for her until her death 24 days later. Now, in 2018 he’s back facing the ultimate running challenge. Though Sichel’s temperament is cool, he runs best when the mercury stays below 95 degrees Fahrenheit. The long, excruciating heat wave which ushered in July affected his time, and the volley of thunderstorms which closed out the month further dampened his performance. According to race updates, he has now completed 2,830 miles in 50 days, but can’t reach 3,100 miles by the deadline. Still, no bookmaker would give odds that Sichel will quit before Day 52. His many fans in Orkney (and throughout the running world) would be sorely disappointed! If the Self-Transcendence 3100 Mile Race is a hero’s journey, William Sichel is a torchbearer of the life-affirming aspect. He remains a hero whether or not he manages the full distance this second time around. The race ends on the evening of August 7th. More about William Sichel on Perfection Journey. UPDATE 1: William Sichel continued to run, and by Day 52 achieved a total of 2,904 miles. Surasa Mairer of Austria and Kaneenika Janakova of Slovakia are duking it out for first and second place in the Women’s Division, with less than 25 miles separating them. In 2015, Mairer broke the long-standing women’s record set by Suprabha Beckjord in 1998. Beckjord’s time back then was 49:14:30:54, but 18 years later Mairer topped it with a time of 49:07:52:24 (6 hours and 38 minutes faster). Mairer’s record was not nearly as long-lived as Beckjord’s. 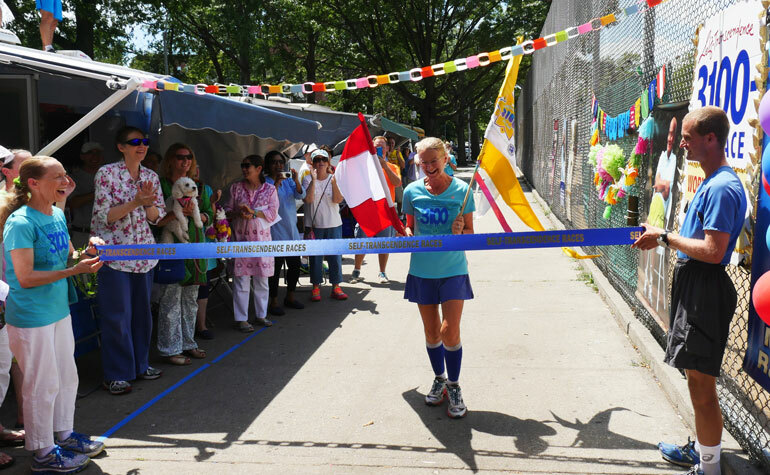 Two years later, Kaneenika Janakova raised the bar for women’s times by acing the Sri Chinmoy 3100 in 48:14:24:10. Now, in 2018 these two record-setters are competing for top spots. Indeed, after Yolanda Holder had to withdraw, they’re the sole remaining women. But due in part to adverse weather conditions, neither are challenging their personal bests. Both are expected to finish on Day 52. It can be very challenging to control the mind and the thoughts during this race. What I do not want to think about is the distance and the number of days or weeks I have to spend on the course. If I do that it gets very hard because all my mind wants to do is to find the reasons why I should not be doing this race. In order to avoid this I have to trick my mind. As much as the physical preparation is important, for me it is equally important to devote time to practice meditation. Meditation helps me tremendously to calm and control my mind and also helps me to be more aware of my abilities and believe in my true potential coming from inside. Running and meditation complement each other in my life. I try to quiet the mind and go inside the heart. The heart doesn’t calculate or plan anything. It is just full of joy and eagerness. What will the 2019 pilgrimage of 3,100 miles bring? Better weather, we hope, and another year of auspicious good fortune for those who dare to challenge impossibility. UPDATE 2: Both Surasa Mairer and Kaneenika Janakova reached their goal of 3,100 miles on Day 52, at times running through heavy rain and thunderstorms. They were the only female finishers this year, placing 4th and 6th overall in a field of ten starters.